Perfect time of day to be out taking photos – lovely blueness plus cosy lights.Vesterålen looks so inviting. And, what I discover now....; the images are crystal clear and brightly sharp in my album, but not so when loaded up to the thread. Don't know why. Quite often i think abou the next trip to Norway, when and how and such things. 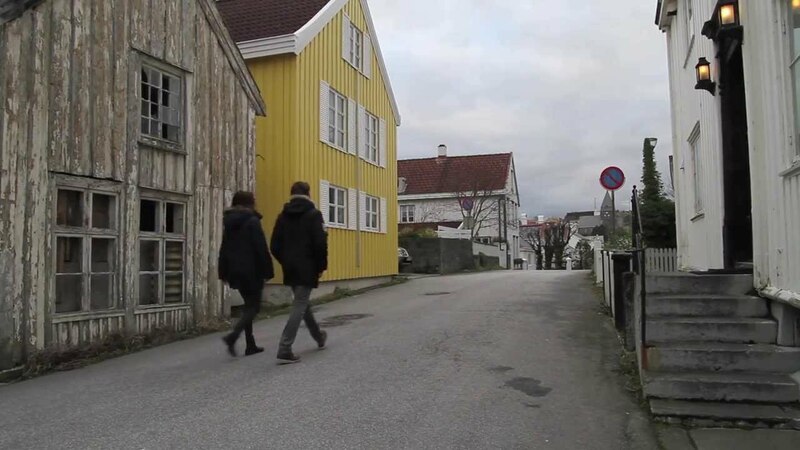 And the images in my mind show so often Kristiansund, and now even more. Just sit and see the ships move!!! (Explaining Norwegian text on the heart signs: KULING=force gale wind, MÅSAN=seagulls, BAUTAN=place name where the city salute cannons are, FISHAN=fish-and-chips. Just ask if you have any questions). No questions at all Svein.Just thank you for this Kristiansund kaleidoscope. Great to see that they dare to make a positive "commercial" video without any sunshine at all, and I think it's really not needed - all the positiveness shines through just perfectly anyway. Remember, this is made by a gang of youth people in an organization called KOM Trainee, which goal is to bring more young people back to their home town...., young boys and girls who are finished with their studies and ready to take their first step into a new job. They (and we who live here) don't need bright sunshine to see that our city is a beautiful place. 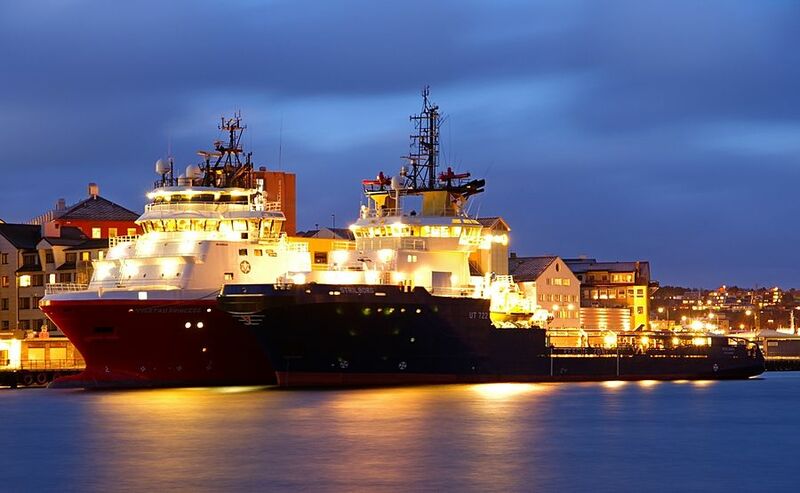 Now, last time I was out to take pictures in darker conditions was when I sent my better half to Trondheim on the HSC in service with Kystexpressen. Today I sent her again, on board HSC LADEJARL, and I went over to Innlandet (Tahiti) to try out my tripod again. There seems to be some unsharpness due the movement of the ships. The last picture is taken with a exposure time of 30 seconds, which make the water look very nice but adds some blur to ships. Try to boost the ISO to get a shorter exposure time, experiment with 3-7 different ISO/exposure time combinations and review in the computer. That will give you some feeling about what times will work. The first two images has more blur to them in CVF than they have on FB and in my albums. Just to clarify, they are not bad at all, I just found out some tips for improvement. I know. I see the blur myself...., and I'm greatful for any tips. Want to try them out as soon as possible. But the main reason for tonights blur could very well be the gail wind, and me have to cover the tripod and camera as best as I could with my body. Not the perfect night for photography. The ISO 100 tip is dating from the old film era, and the early digital era when there was much noise at high ISO. But modern digtal cameras have developed. If you use 100 ISO, you will get a slow shutter speed and burn out the highlights. I think I would fell for taking this picture at ISO 1200 - 1600 and f/8. Have a look at the post "Problems with Photobucket" about sharpening the pictures before posting. I like the video and as Tommi i like the fact that it shows no extrordinary weather. The country music style is always a goot transporter of be-at-home feelings.I like your pictures and i am much too limited in my photographic knowledge to give any advice. I just enjoyed! Great new additions.... if you were a truck driver, I would have said "keep on trucking" but I think I go for "keep on taking pictures!" How could I ever forget you Thijs..., THE truck driver among us today.... . Shame on me! Anyway, today the young students in KOM Trainee had their kick-off of the Æ (heart) KRISTIANSUND (english: I love Kristiansund) campaign. In the rain and force gail winds they had stands in the city, handing out different stickers with I (heart) and t-shirts and stuff...., and they also want people to post pictures of whatever has to do with Kristiansund on their homepage, FB-page and instagram ( #ilovekristiansund ). As part of the campaign kick-off, they also had their slogan up on the Hollywood-ish sign you all know by now. Two white lights on the Stormvarselet show forecast of force gail winds from west. What to do on a Sunday evening, 1. December...., in cold northwestern winds and hail??? 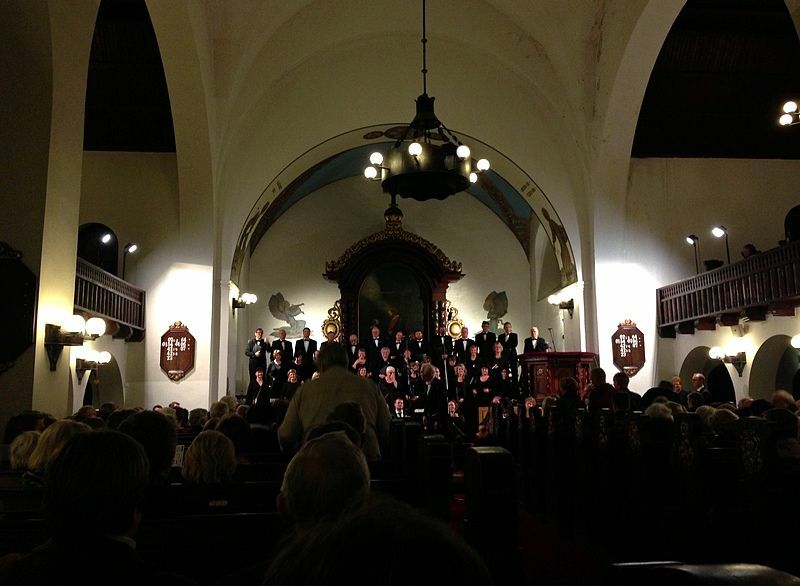 By a ticket to attend Georg Frierich Händels MESSIAH performed in Nordlandet church by Kristiansund Chamber Choire and Baroque orchestra. Solo performers were Sigrid V. Bøe (soprano), Rachael Lloyd (alt), Matthew Long (tenor) and James Birchall (bass). I've heard MESSIAH on Spotify several times, but to hear it live...., wow! Very beautiful image, Svein, even if "a poor picture from my iPhone". I've sung the Messiah with a choir and that chorus certainly is hair-raising, with tingles down your spine, too. You just want to sing your heart out, so powerful is the experience.